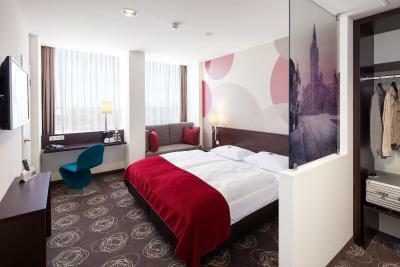 Lock in a great price for Webers - Das Hotel im Ruhrturm – rated 8.5 by recent guests! Peaceful and quiet location, the staff are easy to approach. We have a nice stay. The room was lovely and had everything we could want or need. Great nights stop over on our long drive back to England.Big ,clean, warm ,well equipped, and comfortable hotel with lovely staff and spacious rooms.Soundproofed and air conditioned so we had a much needed rest before another very long journey home to England.There was no restaurant but there were places close by as well as Macdonalds & Aldi.Highly recommend. Clean, spacious, comfortable rooms. The staff were great, friendly and helpful. 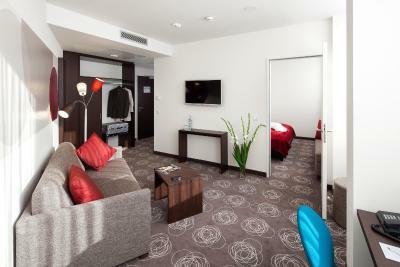 The renovated rooms are excellent! Space available is correct, and the design is modern. I stayed here two nigts being in a business trip. The stuff was very kind, I arrived late, the restaurant was closed, but they offered a very tasty salate. Cleanness ewerywhere and very rech breakfast. Webers - Das Hotel im Ruhrturm This rating is a reflection of how the property compares to the industry standard when it comes to price, facilities and services available. It's based on a self-evaluation by the property. Use this rating to help choose your stay! 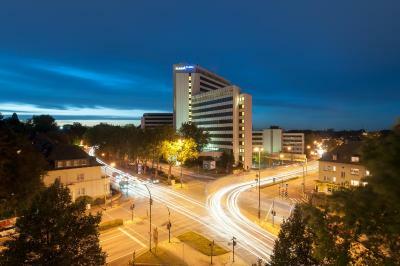 This modern hotel is in the southern district of Essen and just 1.2 mi from the center. 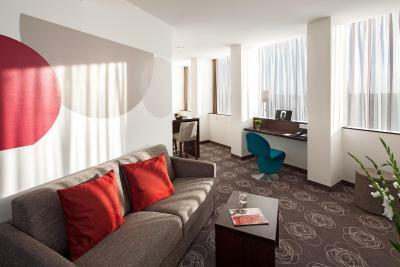 Opened in 2013, Webers - Das Hotel im Ruhrturm offers free wireless internet and a 24-hour reception. Each of the rooms at the hotel is decorated in an elegant style and includes cable TV. The private bathroom has a shower, and some also boast a vanity mirror. 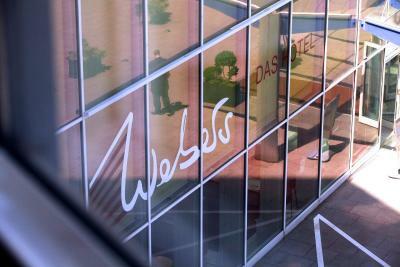 An optional breakfast buffet is available at Webers - Das Hotel im Ruhrturm for an additional charge. A selection of snacks is offered at the hotel bar. Essen Exhibition Center is set just 3.1 mi away from the hotel, and the city’s popular cathedral is a 15-minute walk away. Museum Folkwang is 1.9 mi from Webers - Das Hotel im Ruhrturm. Düsseldorf Airport is 19 mi away, and Essen Main Train Station is a 15-minute walk. Huttrop is a great choice for travelers interested in business, theater and culture. When would you like to stay at Webers - Das Hotel im Ruhrturm? 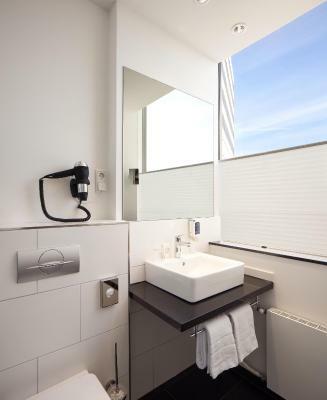 This modern room includes cable TV and a private bathroom with vanity mirror and hairdryer. The room offers extra space. Private parking is available on site (reservation is not needed) and costs EUR 10 per day. This modern room includes cable TV and a private bathroom with hairdryer. 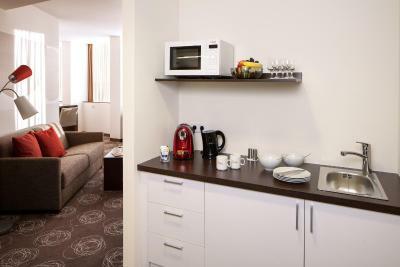 This room is extra spacious and includes a kettle/ coffee maker. RWI, Rheinisch-Westfälisches Institut für Wirtschaftsforschung e.V. House Rules Webers - Das Hotel im Ruhrturm takes special requests – add in the next step! Webers - Das Hotel im Ruhrturm accepts these cards and reserves the right to temporarily hold an amount prior to arrival. Please note the hotel's ventilation and air conditioning system is always switched on at a low level, and it is not possible to open the windows. Please note that the bar is closed on Sundays. Their wasn’t anything we didn’t like. There was parking outside for free but as we had a lot of belongings with us and were travelling home by car we wanted secure underground parking which I thought was expensive at 10€ a night ,so it cost the family €20 .As it is a business hotel I suppose it wouldn’t be a problem for most people ,with the company paying.Worth it for peace of mind though. No fridge in the room; breakfast was a bit pricey at 14 euros per person so we opted out. Unwelcoming bare parking lot in front of hotel with parking places cordonned off with plastic emergency bands. Decent breakfast options. Welcoming staff. Quiet enough rooms despite location near a big street. Comfy and clean.